Sitting down to press events is always a fun experience. The developers come out of their cubicles and talk about the game, show off some features to the press, and quite often act a bit awkward in the process. It’s cute. 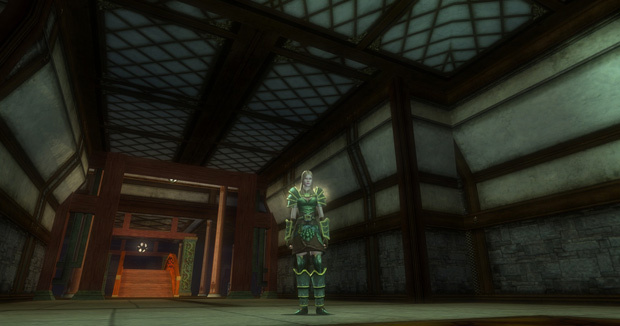 The DDO devs are nothing if not earnest performers, and clearly love their game and the setting it takes place in. I just wish they were a bit less nervous when presenting things. I haven’t ever heard the utterance ‘uh’ made so many times in one hour. I was afraid one of them might be having a stroke. I’m just teasing, of course. They still did a good job. Anyways, Dungeons and Dragons Online is still putting out regular content updates, and this month is no exception. With the introduction of a new high level class, revamped raids, and continuation of their Eberron epic story, there’s plenty for dedicated players to get up to. The update is called Mark of Death, and comes not just with new content, but a number of new features that players have been asking for. The most obvious new addition is the Harper, a sort of prestige class based around being excellent to your teammates, and maintaining versatility in combat. The Harper class can be taken on top of any existing class in the game, and has mutliple trees that support and enhance just about any kind of character. The vanguard tree, for example, is for fighters and paladins, and adds a great deal of offensive power to the arsenal of players who prefer to fight with sword and shield. This ties into an overall revamp and balance adjustment to fighters and anyone else who regularly wears heavy armor. Before, light armor was often the go-to option for players, because of its ‘evade tank’ qualities. Now, heavy armor is a more than viable option, and to christen this rebalancing, they’ve taken a long, hard look at how sword and shield combat works. They’ve added new animations for shield bashes, shield slams, and other brutal attacks. Being a heavy has never been more satisfying in DDO. Speaking of armor, the players of DDO have been asking for a means of swapping out the cosmetic appearances of armor for years. Well, the game finally has it, in the form of the Mirror of Glamering. Players simply place the armor set they want to be wearing into the device, synthesize, and then equip it in a special cosmetic slot. Now, at long last, players can wear the look they want to, instead of being forced into the latest mandatory, high-stat uniform if they want to be competitive with others. The dev team has plans to expand this feature to weapons and shields also. The actual content of the Mark of Death centers around a place called the Orchard of the Macabre, a place where two rival factions have been fighting: the Emerald Claw and the Silver Flame. 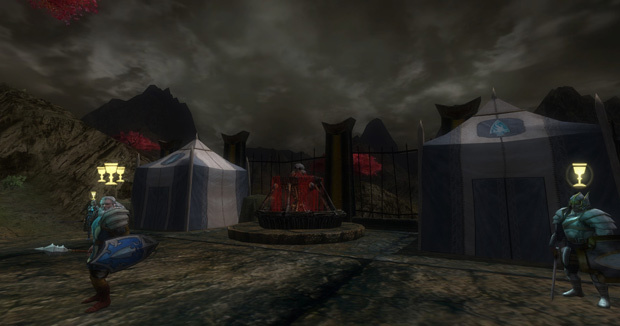 The Orchard of the Macabre has been used in previous content and is a well-known part of the game world. But it has been revamped and redesigned to be simply better, so returning players will be pleased to see the changes. In previous storylines, the Emerald Claw and Silver Flame grudgingly worked together to fight an evil entity known as the Black Abbot; now, they are opposed. The Emerald Claw has released a new lycanthropy scare into the Orchard of the Macabre to distract the Silver Flame while they work to achieve their nefarious ends. Players will uncover a thickening plot around the reemergence of the Black Abbot, only to find that he is a pawn in the schemes of a greater entity. That greater entity is, in fact, a half-dragon half-elf sorceress that was changed into a Lich by her mother, apparently. And so in the upcoming raid, this unlikely being (who also happens to have a super special birth mark called the Mark of Death) will be the primary foe after a certain phase is breached. I won’t say much more, for fear of spoiling the story. Suffice it to say that it’s all terribly complicated and… well, I suppose ‘epic’ would be the word to describe it. Anyways, if you’re a long-time fan of DDO, you’ll be happy to know all of this content is free for VIP players. The cosmetic changes and rebalancing apply to everyone, of course, and if you’ve been gone for a while or haven’t even tried the game yet, give it a shot. Now might be a great time to do so. I've spent the past couple of weeks with the Live Gamer Ultra, and I have to say that I fell absolutely in love with it.